Apple bin full of freshly picked Honey Crisp apples in an orchard on a sunny day. Pulling away from an apple bin full of freshly picked Honey Crisp apples to reveal an apple orchard on a sunny day. 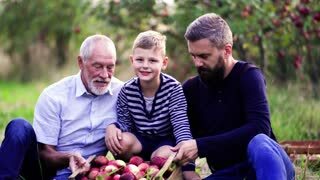 Small boy with father and grandfather sitting in orchard with box of apples in autumn. 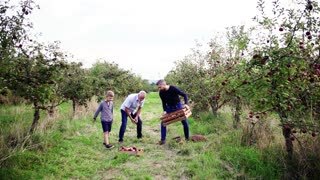 Small boy with father and grandfather picking apples in orchard with box of apples in autumn. Slow motion.